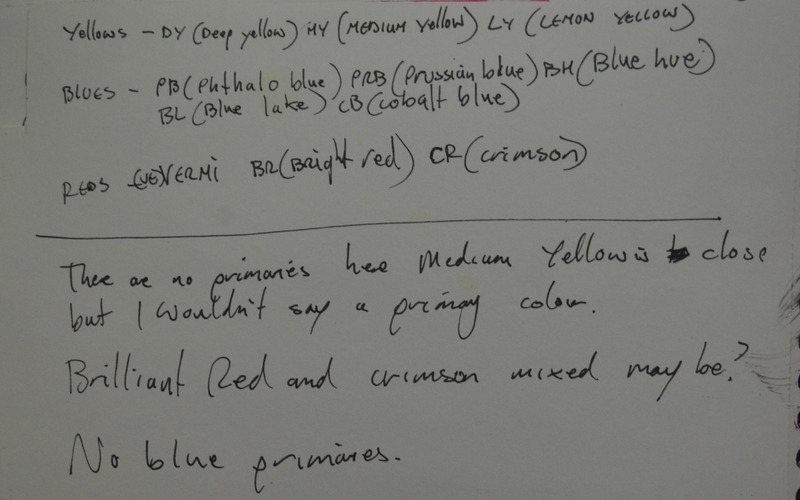 First, identify your primary colours. 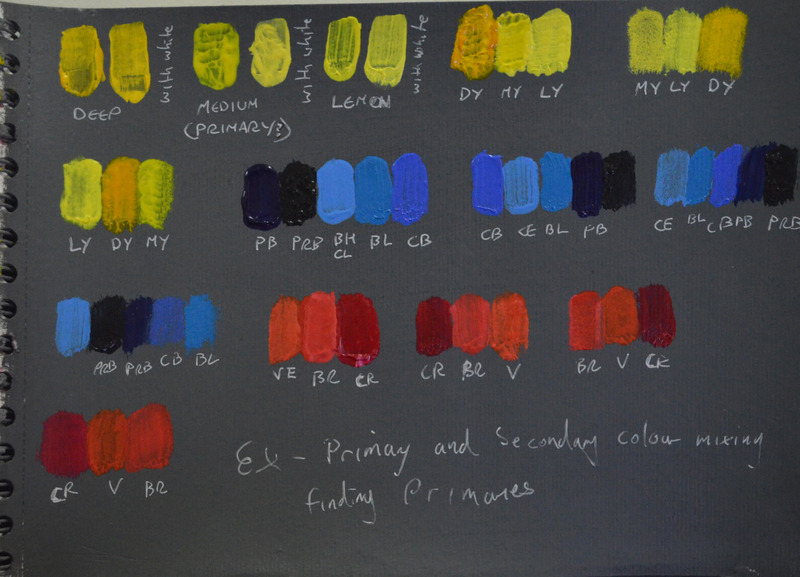 Begin by laying sma ll amounts of pigment onto your palette, arranging them in yellows, reds, blues etc. 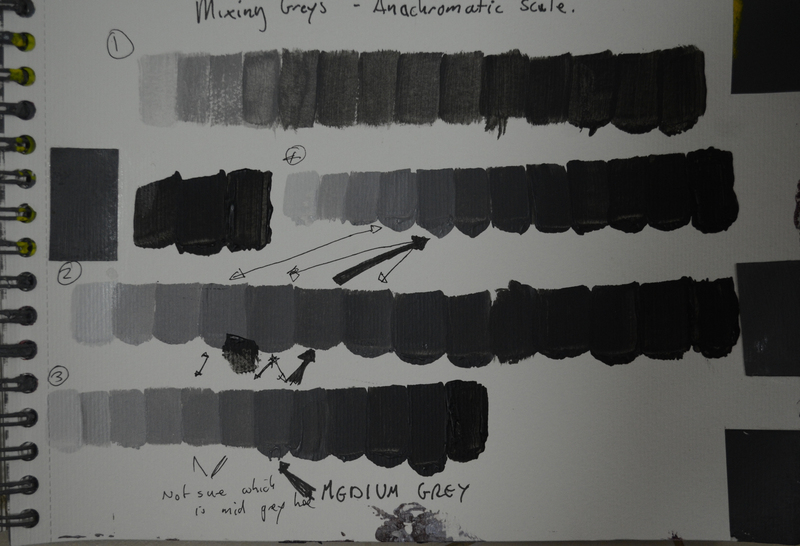 Working on an area of your prepared grey ground, lay all the yellows next to each other so that they touch but don’t mix. 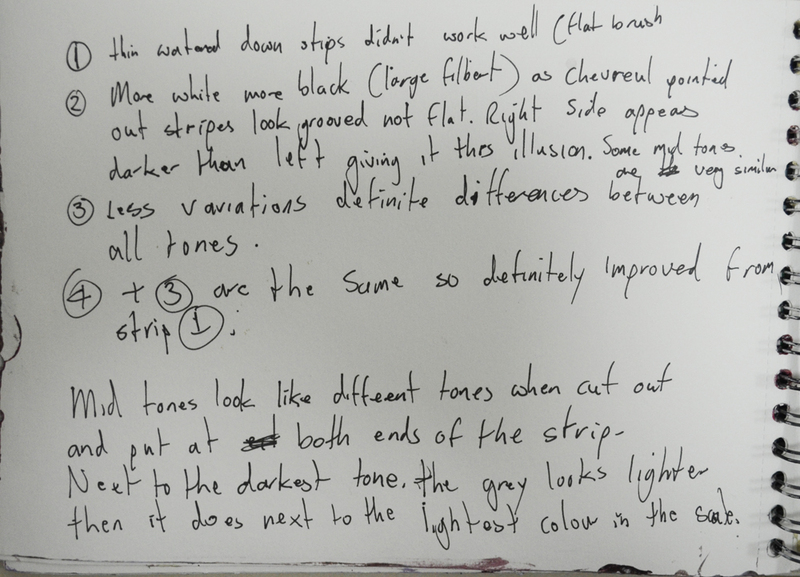 Notice the difference in hue (the way that one colour is distinguished from another), chroma (the intensity of colour) and tone (how light or dark it is). 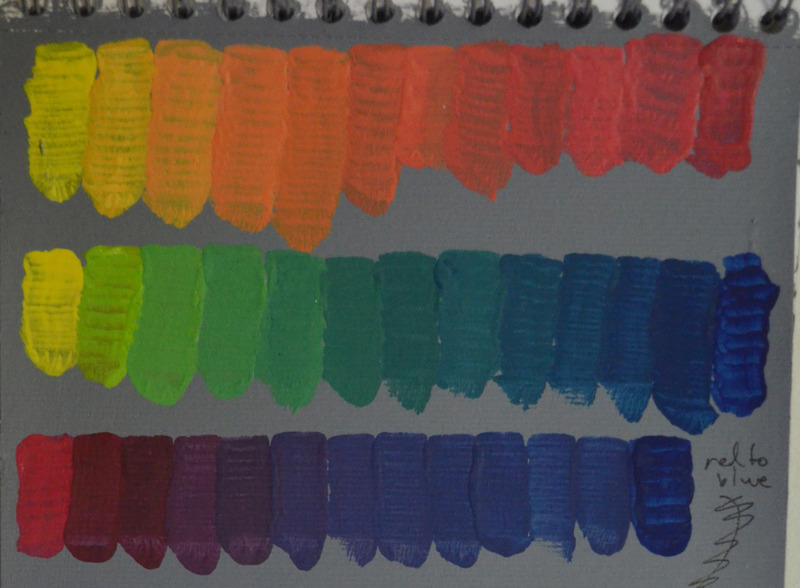 Arrange the yellows in different sequences and how different juxtapositions alter the appearance of yellows. Make note of which is the more intense yellow. 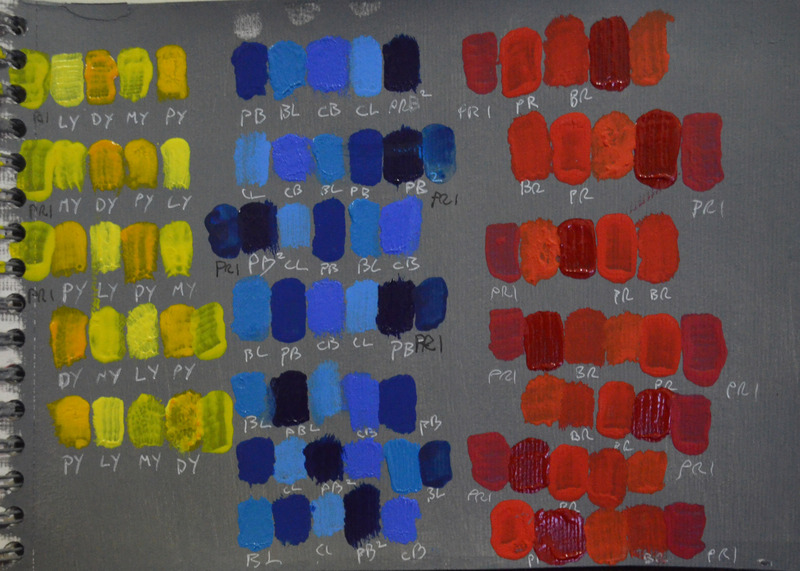 Continue with this exercise using both your blues and reds, you will need to mix a bit of white to see the hue of dark reds and blues properly as these pigments tend to be more transparent. I really should buy more oil paint colours and started working with oils for some exercises as the acrylic paint i uded for this exercise was very transparent, especially against the grey background, and I did use various brands and qualities. I started by laying down all the yellows that I had which wasn’t a lot, lemon yellow, deep yellow and medium yellow. For blues I had Phthalo blue, Prussian blue, cobalt blue, blue hue and blue lake and reds Vermilion, bright red and crimson, there were no primaries in any of the colours, each of them showed sign of other hues and to be honest I really didn’t know what a primary red, blue or even yellow looked like so to be safe I thought it was time to buy primary colours just so I knew. Not having much cash left to last the month the next day following day I purchased three acrylic paints made in Thailand, a red, yellow and blue. They said primary colour on the tubs, but when I got home I realised it was probably a company slogan the paints were very runny, very transparent and very ‘crap’. Still I decided to work with them for now. The red was too bright and didn’t mix well with the Louvre crimson, the yellow was too golden but the blue was ok just too runny. Using what I had for now I laid them all down in strips touching each other and what I noticed was working in different sequences I not only got to see how each colour looked next to another, different tones etc but it also allowed me to see hints of other primary colours within their hues. I began by mixing yellow to red, then yellow to green and then blue to red, which should have been red to blue without white. These mixes can be seen above in the first 6 scales, the mixes were unstable (if that’s the right word) murky and transparent with no steady progress from one mix to another. The next day I did what I should have done in the first place and bought some better colours.I was hoping for Louvre but there were no primary colours so I had to settle for liquitex which was the only brand with primary colours in stock. This time I mixed in a bit of white for each one. The results were a lot better, the colours were less transparent this time, the colours at the middle were less murky and the tones were very even with a beautiful progression in hues from one stripe to the next. 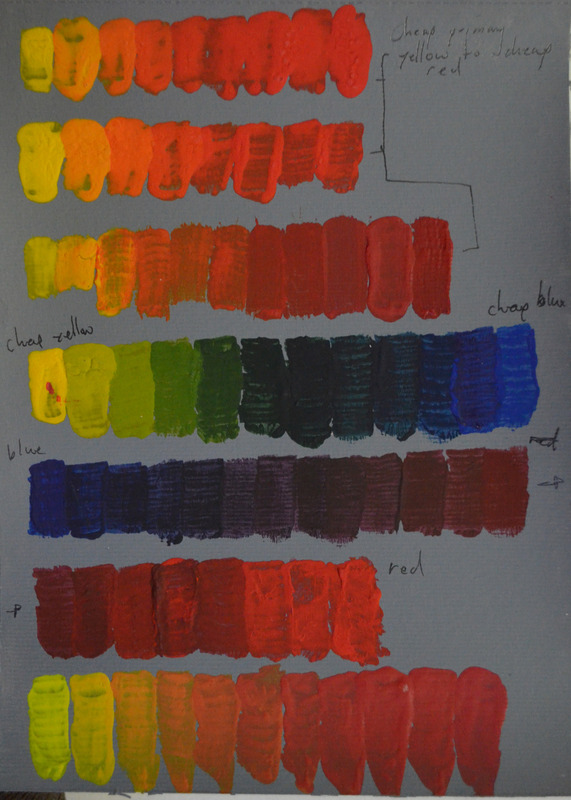 This entry was posted in 3 - Mixing Primary and Secondary Colours, Uncategorized and tagged oca painting 1 course, part 2 close to home, primary and secondary colour mixing, understanding colours on February 24, 2015 by Mark A Smith. 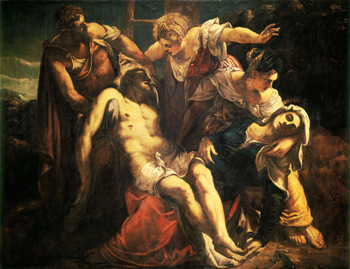 ‘The term chiaroscuro (chiaro meaning light, scuro meaning dark) originated in the Renaissance when it referred to a technique .of drawing on coloured paper by building light tones with gouache and working down to dark tones with ink. It later came to refer to modeling of light in paintings, drawings and prints. The extreme contrast between dark and light areas allowed subtle graduations of tone to create illusions of volume, most notably that of the human form. 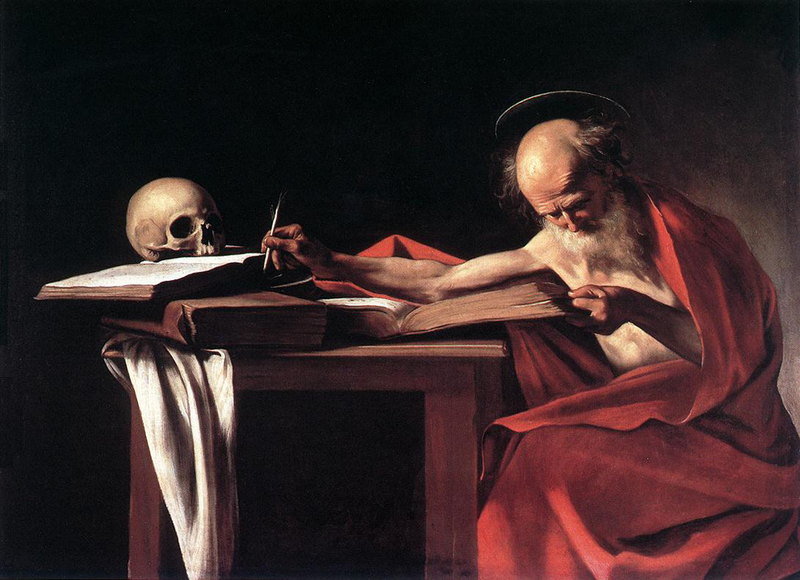 Chiaroscuro became a common composition device in religious paintings such as those of Caravaggio. Towards the end of the 1500’s, with the new religious appreciations due to the Catholic Reformation, night scenes depicting the life and Passion of Christ became increasingly popular. The artist Titian embarked on a new technique which involved the disintegration of matter in light, particularly in night settings. He would continue to explore the dissolution of light through matter until the end of his days. The Next generation of artists would take over and perfect these dramatic effects of light and colour. Night scenes would later become known as Nocturnes (a phrase coined by James Abbott McNeill Whistler). It describes a painting style that depicts reminiscent of the night or subjects as they appear in a veil of light, candlelight, twilight, or in the absence of direct light. 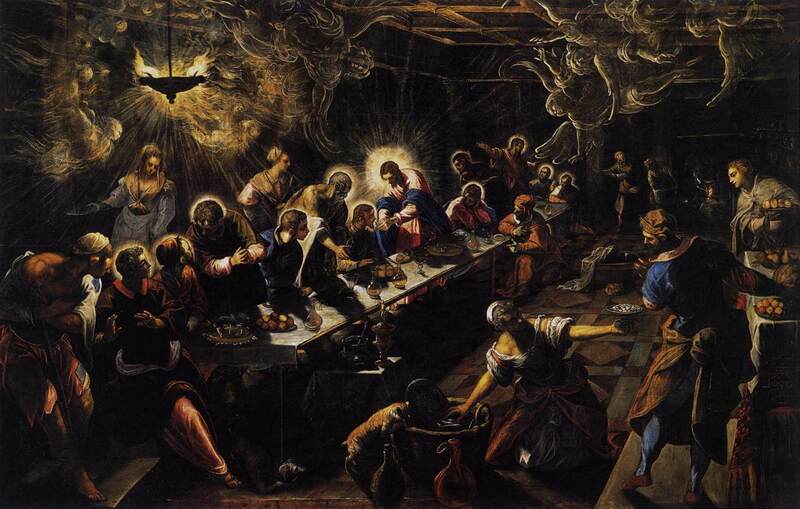 Throughout his long career Jacopo Tintoretto dramatised his nocturnes by drenching them in heavenly lighting, with colours distorted by bold contrasts of light. These lively effects of lighting added drama to his stunning compositions. Examples of this ‘supernatural lighting’ can be seen in both the Lamentation over the Dead Christ and the last supper where light is depicted coming from a source other than a natural one as to Titian’s St Jerome above which depicts natural moonlight. Before moving to Rome, Milanese painter Caravaggio trained as a painter in Milan under Simone Peterzano, a former student of Titian. In Rome the Catholic church were in need of a stylish replacement to Mannerism in religious art, a move that they thought would help counter the threat of Protestantism (the counter-reformation), and so there was a demand for paintings to fill the many new churches and palatial buildings being built there. 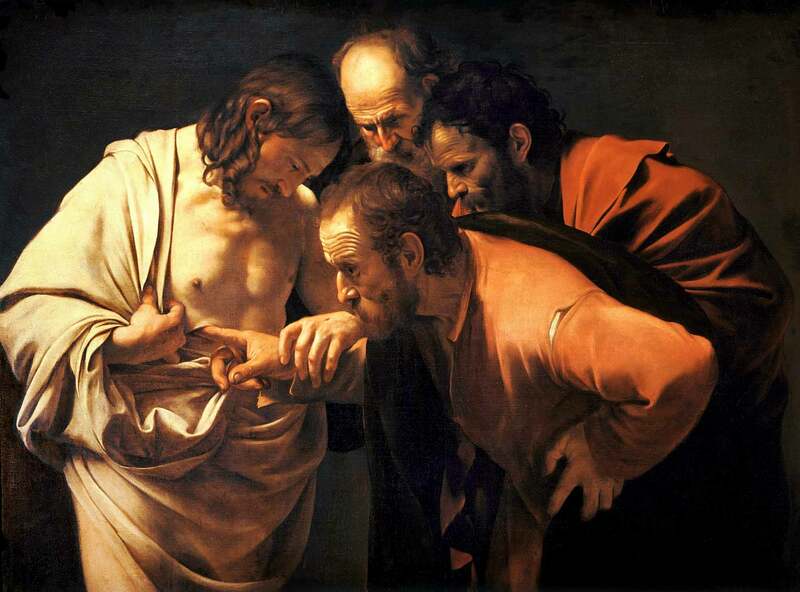 Caravaggio revolutionized chiaroscuro with a radical form of naturalism combining close physical observations with a dramatic, somewhat theatrical, use of chiaroscuro this came to be known as ‘tenebrism’. Looking at the paintings of the three artists above you can see the evolution of nocturnes and of course chiaroscuro as a major technique in night paintings. 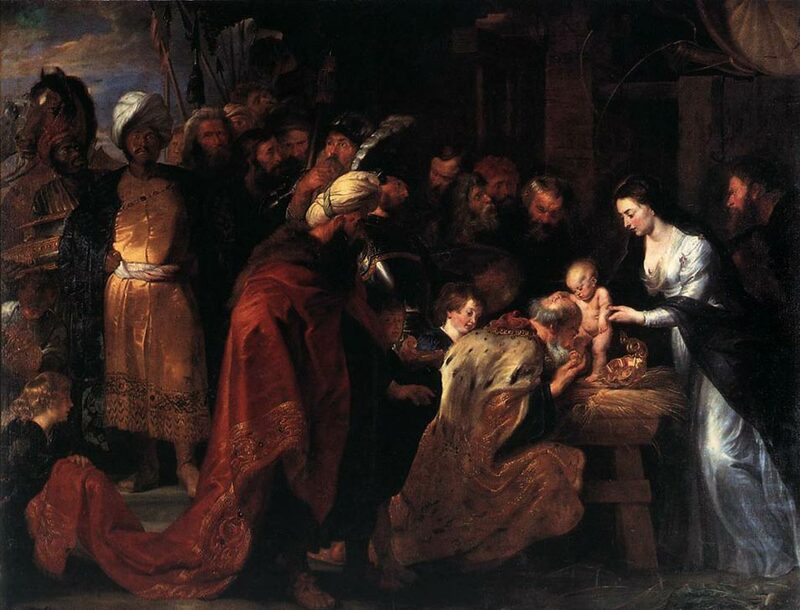 From works of Titian that used the background as an important part of the painting with figures whose forms didn’t wholly employ the technique that it would later become; to the paintings of Caravaggio who had pretty much perfected the technique, at least to where he need to be depicting up-close three dimensional compositions with a clear message that appear to almost leave the canvas. 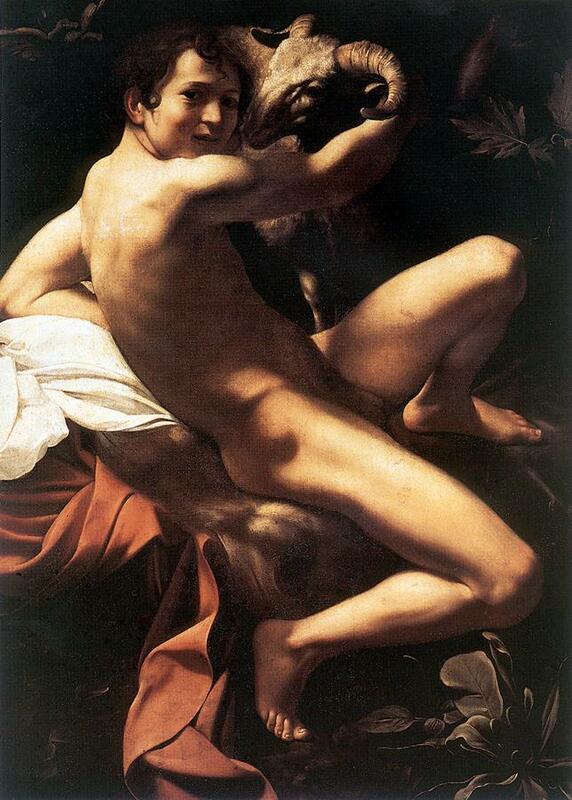 If the paintings of Caravaggio were a Drama then the paintings of Flemish Baroque painter, Rubens would be a musical. Originally from Cologne in Germany, he was as a catholic by his mother in Antwerp, Belgium. 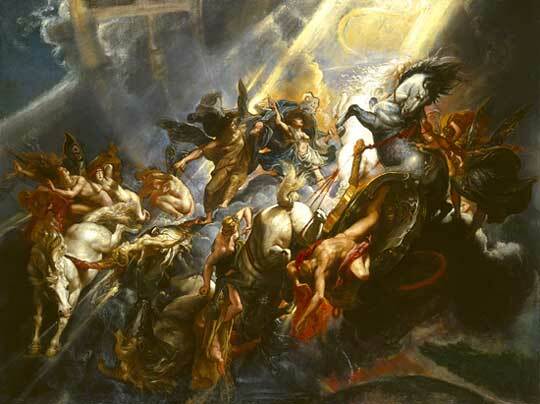 His paintings featured religious scenes in complicated and very dramatic compositions. 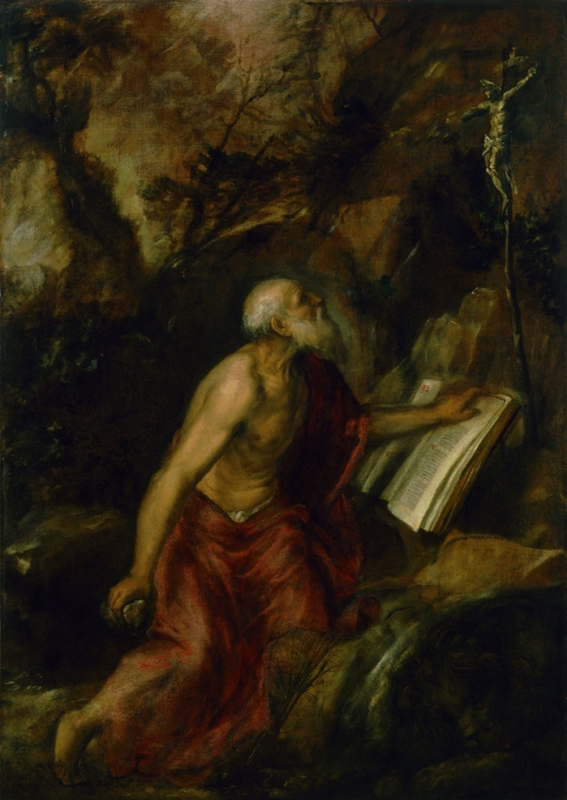 Rubens became one of the leading voices for the Counter-Reformation style of painting and standing behind what he had worked so hard to ‘promote’ he stated, “My passion comes from the heavens, not from earthly musings”. It is clear from his paintings that he was a man of faith, something was clearly moving him through these paintings, if not just belief. Where Caravaggio painted close-up dramatic scenes of a biblical theme with detailed expressions and drapery Rubens’ painted religious scenes in action, depicting flowing drapery and strong movement in his figures, with complicated compositions with several main figures and even horses. ‘Night Scene’ but then again I now know what I am looking for, to others that don’t, they see every bit of the composition as if everything in the painting was completed in detail, what the eye doesn’t see, the brain fills in. 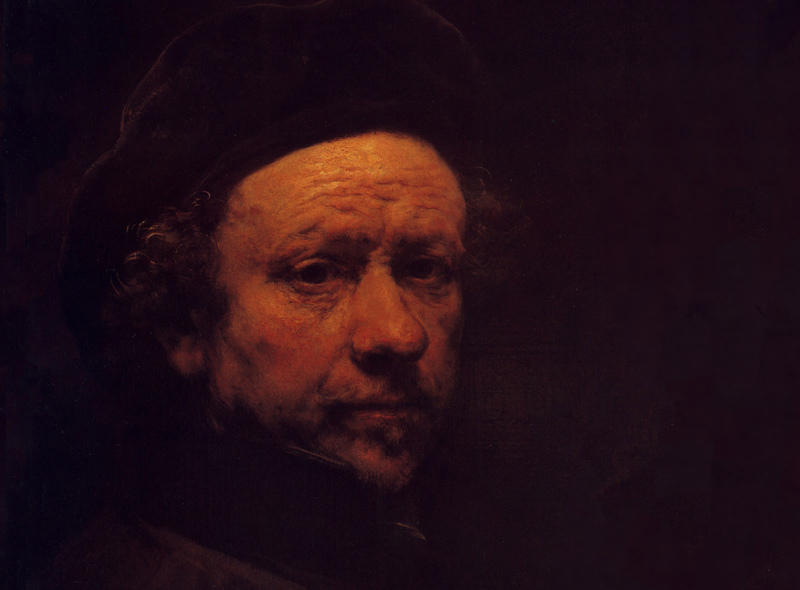 For the best examples of chiaroscuro in Rembrandt’s paintings one needs to look no further than his self-portraits. Rembrandt created nearly one hundred self portraits in his lifetime. Of those one hundred self-portraits seven were drawings, thirty two were etchings and fifty were paintings. Included in those were candelit studies, painting by candle light. Rembrandt’s candlelit studies are great examples of the use of chiaroscuro, I looked at several of his self portraits the technique but ‘Self Portrait 1657’ was one that really stood out, the reasons for this being that you can see how the face and highlights in the hair and hat have been painted building up the light tones on the dark background. I can imagine him painting it, where he started and can even guess some of the brush techniques that he used. The artist Joseph Wright of Derby was unknown to me, as an artist that is but is name was famiiar and when I did a search fore information about the artist I came across the Joseph Wright college and it clicked. 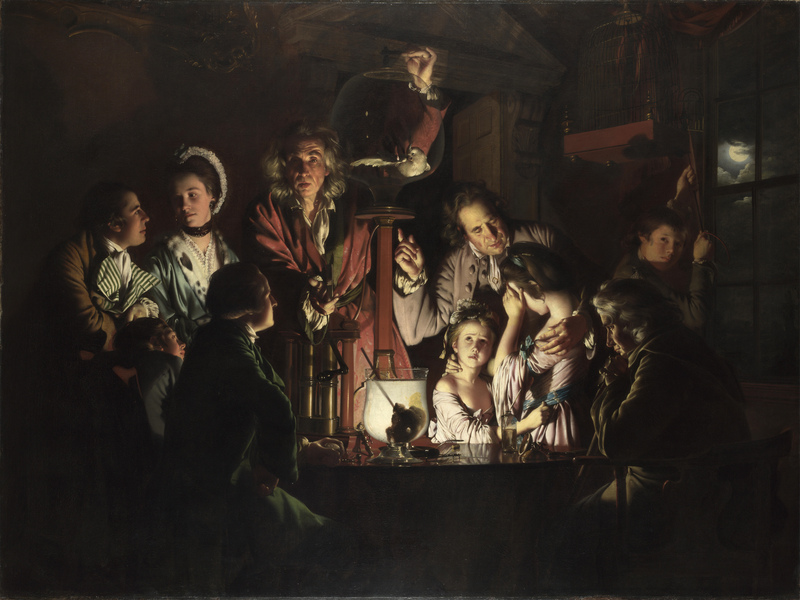 Joseph Wright did for the industrial revolution and science as Titian, Tintoretto and Caravaggio did for the counter-reformation, ‘using their own tool against them’ comes to mind. 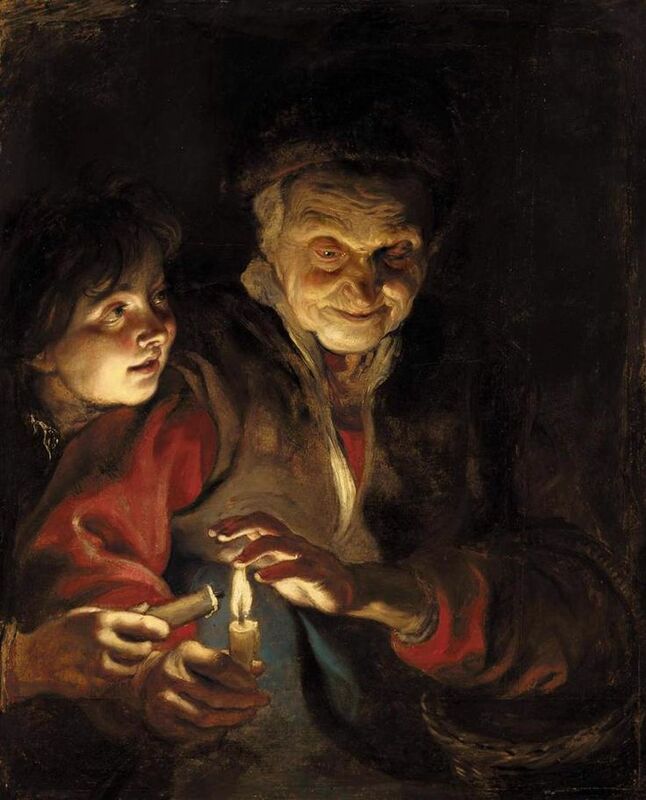 It’s ironic that using chiaroscuro effect was the best way he could describe the candlelit scenes of the ‘Age of Enlightenment’ when the chiaroscuro effect had been employed by so many earlier artists who had described religious scenes through their art. His style was very similar to Caravaggio but using more detailed, technical compositions and painting them from a distance. 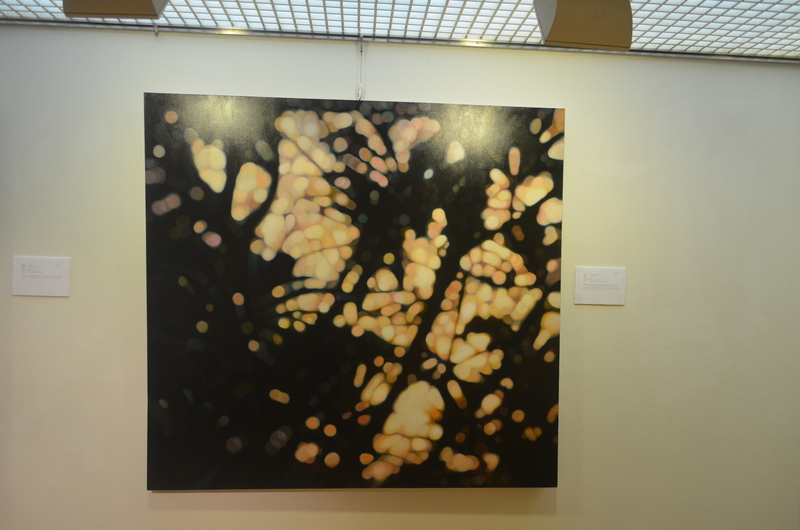 What makes his paintings different from earlier works however, his is exceptional use of shadows. 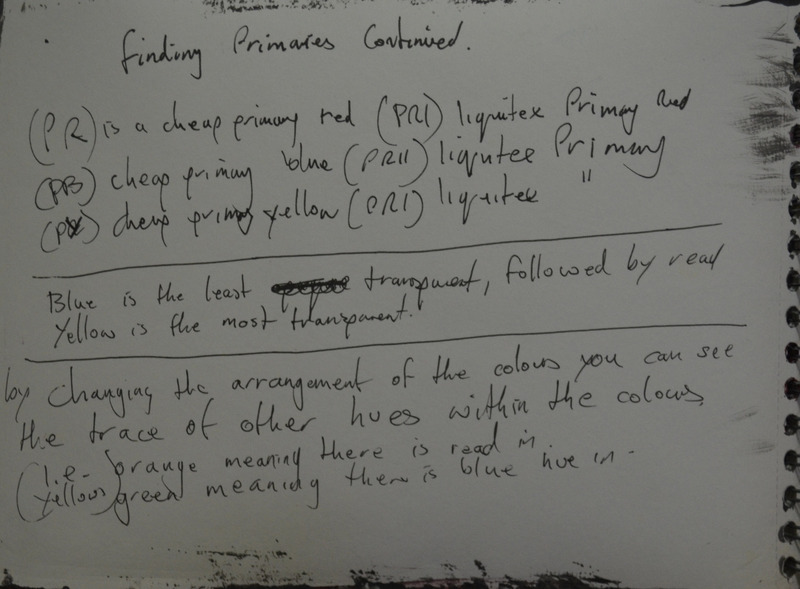 This entry was posted in 2 - Chiaroscuro, 2 - Research Point - Chiaroscuro, 3 Working on Different Coloured Grounds, Coursework, Pt 1 - Introduction to Painting, Uncategorized and tagged basic paint application, chiaroscuro, part 1, research point, working on different coloured grounds on January 26, 2015 by Mark A Smith. I had passed the Queen’s Gallery literally thousands of times ( I used to work acroos the road) and never realised it was actually a real art gallery. I used to think it was an art gallery styled gimmick to get money off tourists never entering thinking that they would charge the earth. 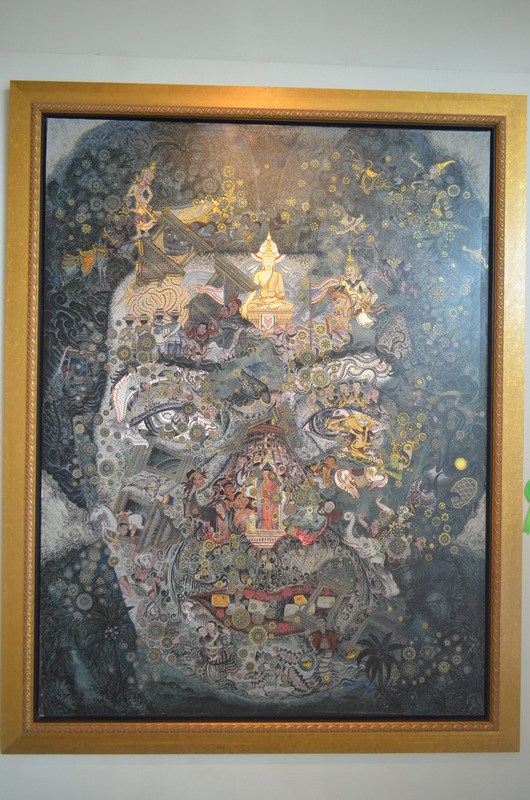 For the last two years i had been visiting the national gallery which as an appauling colection in its permanent exhibition to say they charge toutists 300 baht or somewhere near and the temporary exhibitions are not very often. After reading tripadvisor and finding out it ws only 30 baht admission and it was allegedly even better than the museum of contemporary art i ventured down to see what was on. 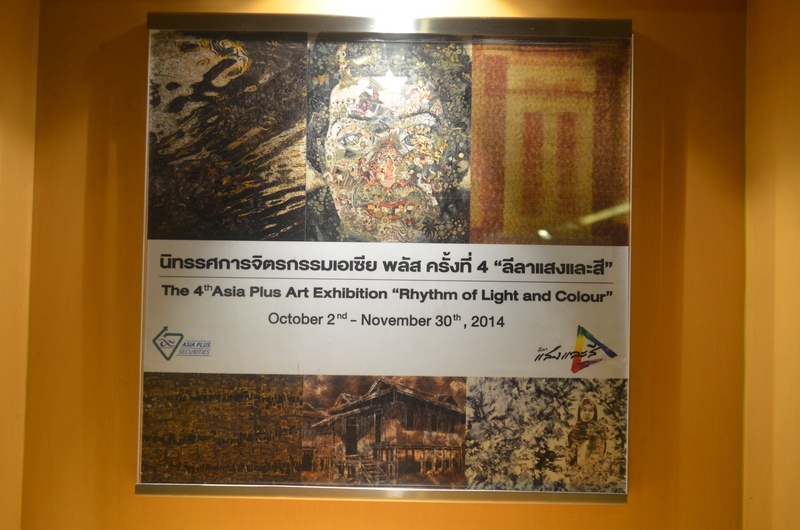 the sign reàd the 4th Asia Plus Art Exhibition ‘Rhythm of Light and Colour’ 2nd October to 30th November, this is what I found on the internet. The third floor was closed and then on the 4th and 5th floor there were the next lot of competitors starting work on their submissions. It would have been good to have gone back while they were full steam to take a look at them using different techniques but time hasn’t allowed me to. I am hoping to go back and see the work that the next lot of artists produced. 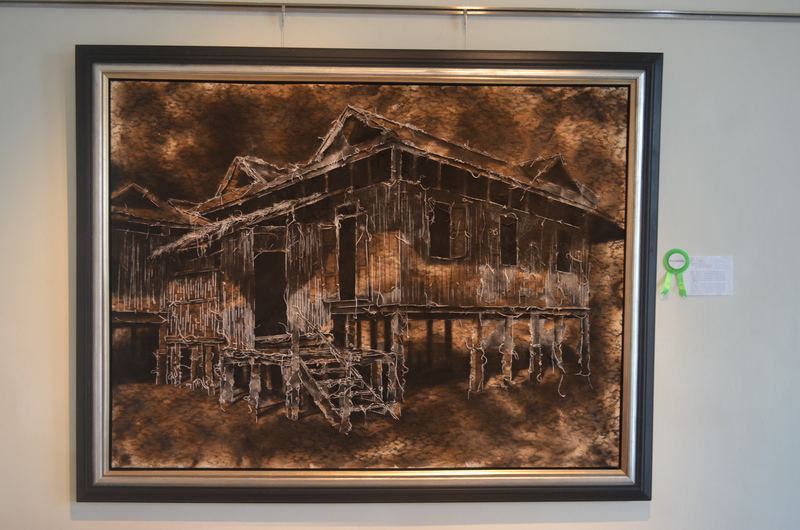 The quality of work produced by these young Thai art students was excellent and very inspiring, I particularly like paintings of the traditional Thai houses. I am hoping to be able to get out and draw/paint some similar works over the duration of this course. 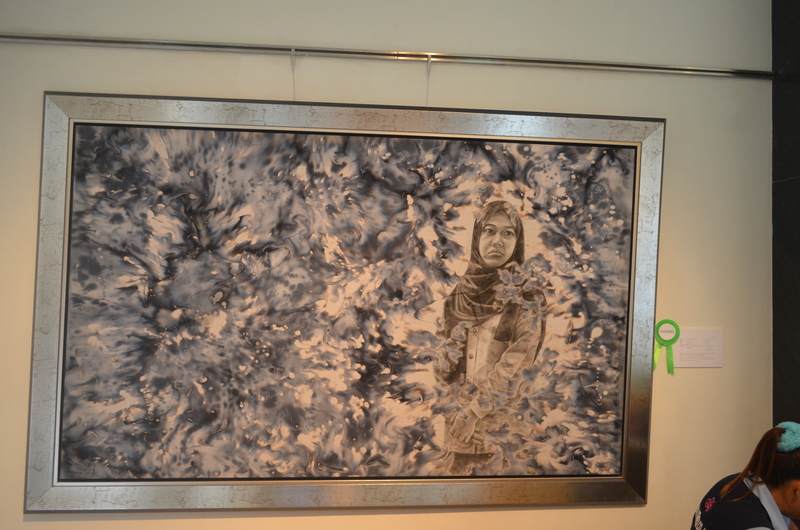 This entry was posted in The 4th Asia Plus Art Exhibition, The Queen's gallery, Uncategorized and tagged research point, study visits, The 4th Asia Plus Art Exhibition, the queen's gallery on November 18, 2014 by Mark A Smith.